Fox, the company that will emerge after Disney completes it US$71.3bn acquisition of 21st Century Fox’s key entertainment assets, has appointed its top government relations and corporate communications execs. 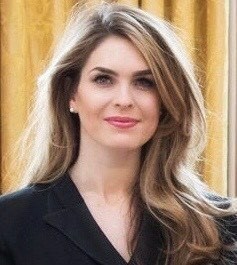 Hope Hicks, who most recently served as White House communications director and director of strategic communications for president Donald Trump, has been appointed as Fox’s executive vice-president and chief communications officer. General Electric’s senior government affairs and policy executive, Danny O’Brien, has been named as Fox’s executive vice-president and head of government relations. Hicks will be based in Los Angeles, O’Brien in Washington, and both will report to Fox’s chief legal and policy officer Viet Dinh. Both appointments will take effect once the Disney deal closes and ‘New Fox’ is created. “Hope and Danny are proven leaders and world-class public affairs professionals. Together they will define and project Fox’s voice to our relevant communities,” said Dinh. The news comes a week after Lachlan Murdoch, the future chairman and CEO of ‘New Fox’ revealed leadership appointments across distribution, ad sales operations and corporate functions. Among these appointments, Mike Biard will be upped from president of distribution for Fox Network Group to president of operations and distribution for New Fox; Steve Tomsic, executive VP of finance and deputy CFO at 21st Century Fox, will be New Fox’s CFO; and Pauls Cheesebrough will join the duo as chief technology officer and head of direct-to-consumer platforms. New Fox will be home to branded properties such as Fox News Channel, Fox Business Network, Fox Broadcasting Company, Fox Sports, Fox Televisions Stations Group and sports cable networks FS1, FS2, Fox Deportes and Big Ten Network. Separately, 21st Century Fox agreed to sell its 39% stake in Sky to Comcast late last month after the US pay TV giant emerged triumphant from an intense bidding process. Disney commented at the time that the Sky deal, combined with the divestiture of the Fox Sports Regional Networks, will significantly reduce the amount of debt it will incur in acquiring 21st Century Fox.